Good morning, you wonderful people, you! It's finally starting to feel like falltime (I'll spare you the comments about pumpkin-flavored everything; that's what social media is for). The weather was cloudy and brisk with the slightest drizzle outside, and I even took Dug on not one, but two walks this morning, which both excited and confused him as he's a dog of strict daily routine by choice. And if splashing around in the puddles during our walk wasn't enough, he STILL wanted another bath. 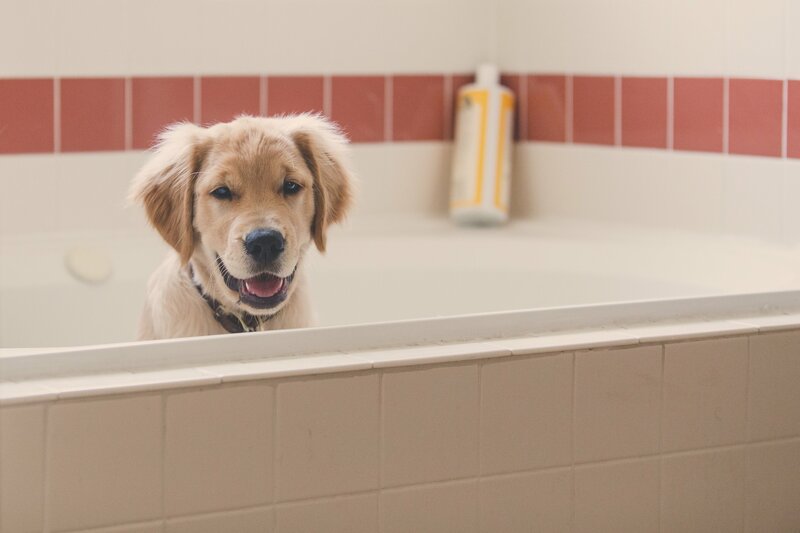 So he jumped into the bathtub and waited patiently, as he does almost every morning. Pictured: Definition of "water dogue," awaiting his bath. All dog-frolicking aside, let's get back to the heart of this blog. What's an unpugged ceremony, exactly? Let’s face it. Most of us are guilty of being attached to our devices pretty considerably, and at the most inopportune times. During a momentous event such as your wedding day, unplugging and being in that moment is so important. For this reason, we encourage our couples to consider an unplugged wedding ceremony. By having an unplugged wedding ceremony, you’re politely asking your guests to be present and experience the moment with you, to be part of the love you’re sharing on that special day. You put so much time and effort into planning your wedding, and we want you to look back on your day remembering the smiles, tears, and faces of those you love as they watch you exchange your vows. These things are so much better experienced directly instead of through an LCD screen. 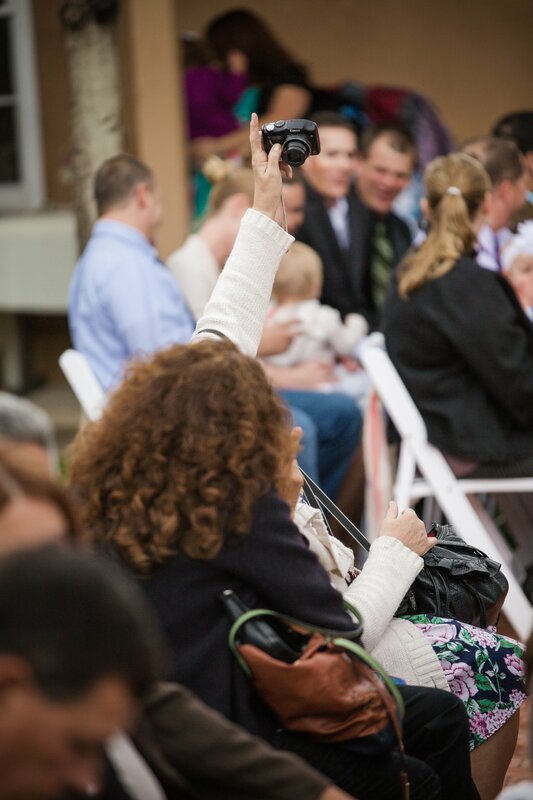 Most of all, we want to make sure you have incredible wedding photos where the most crucial moments won’t be blocked by a sea of devices being held in the air, or by people standing in the aisle with iPads, smartphones, flip-phones, two soup cans tied together with string, or whatever you kids are using to communicate with these days. Pictured: All guests being present in the moment. Amy and I are guilty of being on our devices as much as any other person, and our lives are busy just like yours. However, our clients hire us to capture every moment of their wedding so family and friends won’t have to. Asking your guests to unplug during your ceremony may seem like a difficult decision, but trust us, it’s a decision you won’t regret. 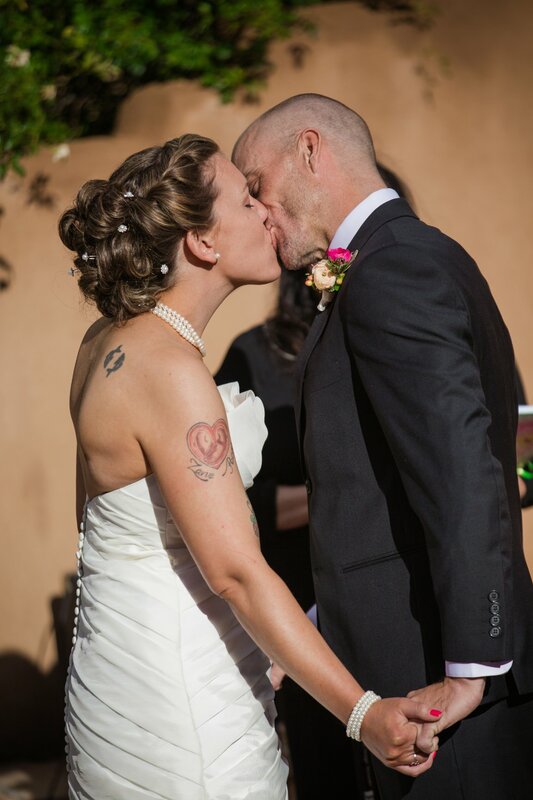 We did this at our wedding, and we're so glad we made the decision to. We now have amazing photos as a result (and let's be honest, when your day is over, the photos are pretty much all you've got to remember it by). Now here's where you may be confused, since we spent the last couple of paragraphs asking you to put your phone away. Are we asking you to unplug during the reception, too? NOOOOOOO! 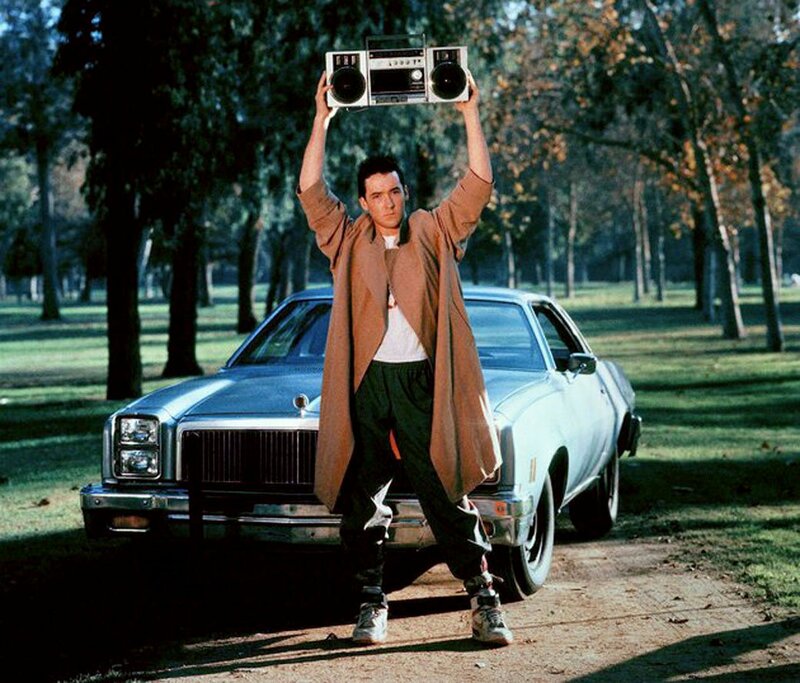 We want you to get reception photos! Create an Instagram hashtag and put it on your table centerpieces if you want those babies on social media! Take pictures of Amy and me if you want! We love photography and want you to be a part of it, too. Did your kiddo eat the dark frosting from the cake and get Joker-lips? 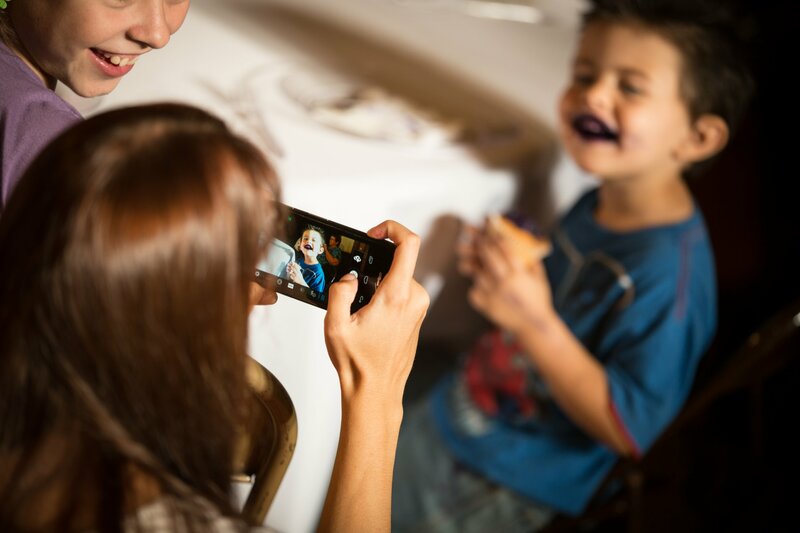 Capture that memory! Remember, it's only the point when the wedding party is walking down the aisle that's the topic of this blog. Want some pictures of yourself before the ceremony? We know that most of you will get all dolled up and will want photos of yourselves all decked out in your finest clothing. Grab that photo! Pictured: Perfectly acceptable pre-ceremony selfie. Old-school style with a backwards camera. So how do we create the unplugged wedding atmosphere? Well, it's a few simple steps, really. 1.) We'll bring it up to you during our initial consultation with you to see if it's something you have interest in. Some people don't mind their guests having their phones out during their wedding, and that's okay with us if it's okay with you. However, if you decide to go unplugged, that will lead us to the next step. 2.) Communicate to your friends and family before your big day. This can be a part of your invitation/save-the-date, or something as simple as an e-mail to your guest list. 3.) 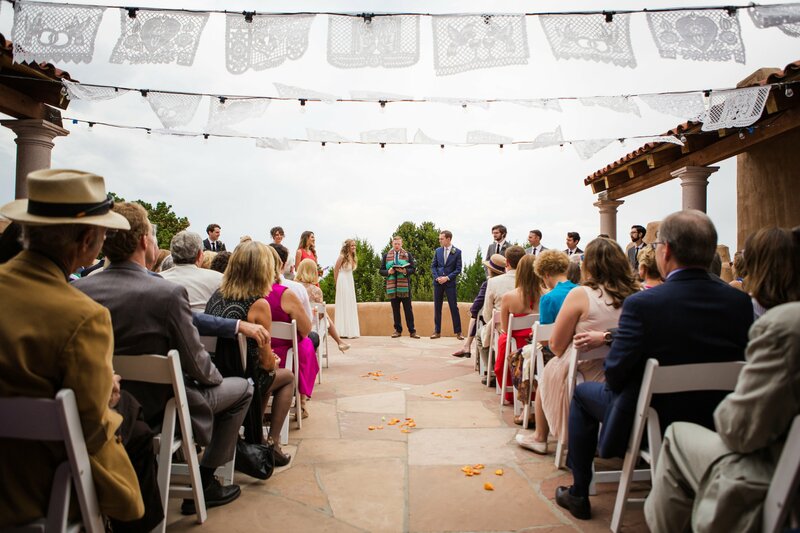 Have the officiant make an announcement before you walk down the aisle. Doesn't have to be a long explanation, just something short and sweet, like "The bride and groom have asked that you fully share in their wedding ceremony, and to please silence and put away all electronic devices. We have the photography covered!" Of course, you may word it however you like, but the short announcement is usually all your guests need, and we notice that the guests are generally very good about putting everything away. 4.) Make a sign or two that can be placed at the ceremony site, usually by the chairs. If you need an idea for verbiage, click HERE to see what the folks at Offbeat Bride have provided. Because your guests are enjoying with their eyes and hearts, I get to capture important shots like your first kiss, unfettered by any devices in the air. Remember, the point of all this is to embed the emotion of your ceremony into the hearts of your guests, and our photos are there to invoke that same emotion every time they're viewed. Let's be honest, there are only a handful of people in this world who can hold an electronic device above their head at an emotionally crucial moment and pull it off like a champ. Pictured: An exception to the rule. If you're not sure how to handle this topic when planning your wedding, we’re happy to discuss how we handled communication with our guests when planning our own wedding and how it was received. E-mail or call us if you need any help with this or any of your wedding planning needs, and feel free to share this information with anyone who may benefit from it. It's been great talking with you today, folks. It's the favorite part of my week. From my family to yours, have a great Tuesday and a wonderful rest of your week.